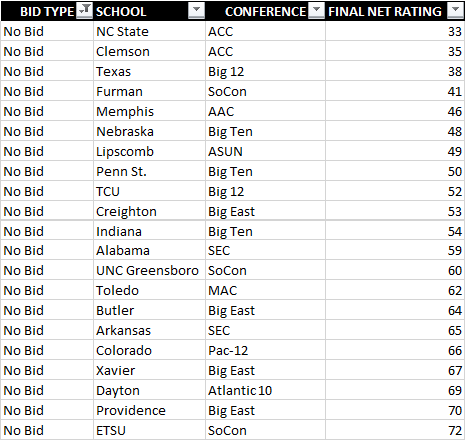 I was curious how much the NCAA relied on their new NET ranking system during the selection process. Thought I would post the results and get everyone's thoughts. The lowest ranked at-large team is St. John's (NY) at a 73 NET ranking. There were several teams that were passed over for St. John's (NY) from a NET ranking perspective. Here is also a break down by conference on teams who 'missed out' by this logic. It looks like they generally followed the NET process while also taking into account recent games and the "eye test". I suspect that the committee was influenced by St. John's location (NYC) and the eyeballs they would attract. I also think that Chris Mullins still has cache. I am still not totally sold on this methodology, but it is an attempt by the selection committee to use a better analytical way to choose teams. NDSU at the line for the lead at the under 4 TO in the 1st.....did not see this coming. Why Duke is not pounding their bigs in the post every possession is head scratching. Memo to Coach K, you've got the most dominating physical specimen in all of college basketball...unleash him on the blocks. Message received at the half. Zion taking over wow!!!! Credit to the Bizun, they hung with Duke for 20 minutes. NSDU and Over covers again....thank you Bison! Really hoping Wofford knocks off UK today. Gives me hope that the mid major isn’t dead. Up by 5 with 10 minutes left in the first. Texas Tech and Mooney going to Yes OT, championship game. Yes OT is right and defense does win championships. Auburn got the shaft. Shout out to the great voice of the Eagles Jeff and prior coach Sean Sutton. Also, Mooney was dynamite Saturday Night.